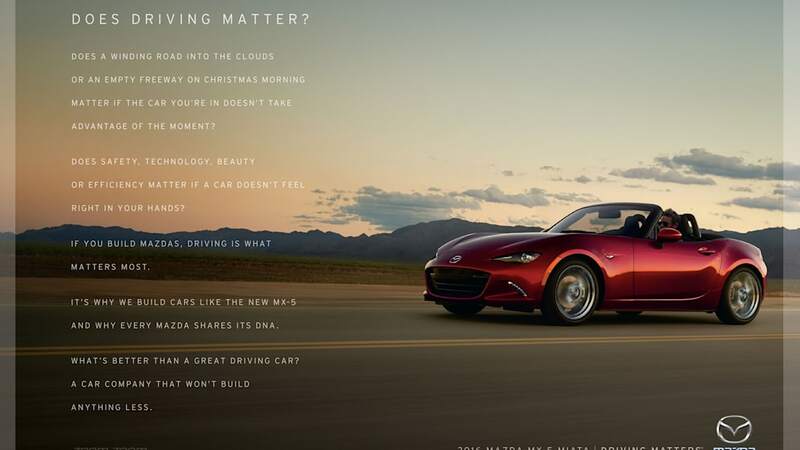 Timed with the launch of the 2016 MX-5 Miata, Mazda is now changing gears with its advertising strategy in the US by launching a whole new slogan. The Japanese brand's latest marketing motto takes a much more direct approach than Zoom-Zoom by simply saying Driving Matters. The two-word phrase is meant to make customers believe that a good time behind the wheel can improve their lives. Driving Matters is also supposed to say something about how Mazda engineers vehicles. "Whether it's for safety purposes or for maintaining our 'fun to drive' nature, it all comes down to the fact that driving matters to our customers and it matters to us." Russell Wager, vice president of marketing at Mazda North American Operations, said in the announcement of the new campaign. However, Zoom-Zoom isn't entirely dead, and the words still appear in small print in some of these spots. According to Wager in an interview with Automotive News, the old slogan isn't necessarily understandable to some focus groups. "I'll ask them to explain to me what 'Zoom Zoom' means, and I'll get 6 or 7 different answers. That's what Driving Matters is supposed to address. It's supposed to solidify what 'Zoom Zoom' means to people," he said. 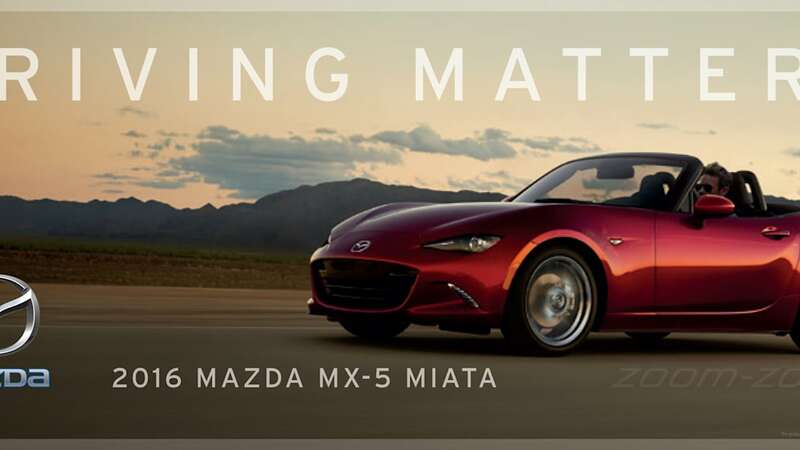 So far, the company has released several examples of the campaign to highlight the Miata and Mazda6. At the same time, Mazda is launching a new commercial (embedded below) called A Driver's Life that showcases many of its models but puts a big emphasis on the MX-5. Mazda Launches All-New Advertising Campaign, "Driving Matters"
IRVINE, Calif. (May 21, 2015) –The Oxford Dictionary defines "driving" as, "operating and controlling the direction and speed of a motor vehicle." Mazda believes that driving is more than a definition. Driving is an experience that can enhance your life. 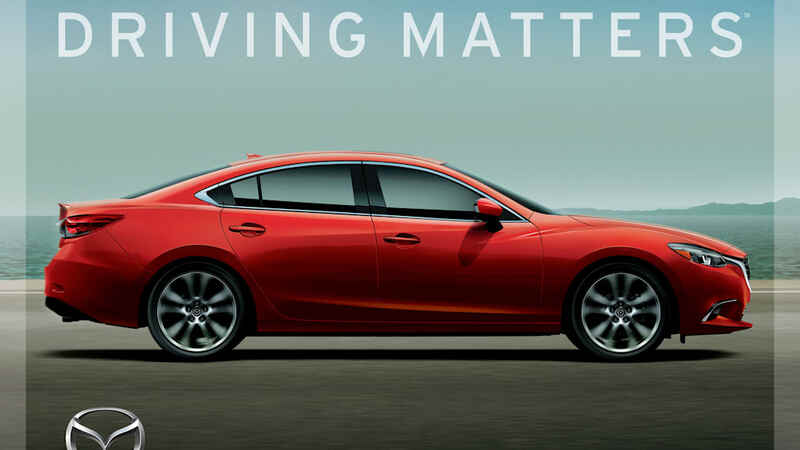 To better illustrate how every Mazda vehicle embodies why "Driving Matters," today Mazda North American Operations (MNAO) is rolling out a new advertising campaign. Driving Matters is an evolution of the Game Changers campaign. With Game Changers, Mazda succeeded in increasing consumer awareness of the functional attributes of our vehicles. Driving Matters will extend the message by creating an emotional connection to the brand. "Through the Driving Matters campaign, consumers will get a glimpse at why driving matters so much to Mazda and why we obsess over every detail in designing our cars," said Russell Wager, vice president of marketing, MNAO. "Whether it's for safety purposes or for maintaining our 'fun to drive' nature, it all comes down to the fact that driving matters to our customers and it matters to us." Mazda's all-new Driving Matters campaign will showcase various aspects of what makes the driving experience so important. Through Mazda's advance technologies and design, the campaign will dive into the importance of vehicle safety, good-looks, fuel efficiency and the fun-to- drive personality of Mazda cars. The engineering and design that goes behind each car in Mazda's lineup epitomizes the enhancement driving has on a person's life. The campaign will launch with "A Driver's Life," which chronicles the major moments and life stages in a driver's life, like getting a license and buying your first car, through raising a family and obtaining your "reward" car. The spot will feature multiple 2016 models but the aim is to celebrate driving and the core values of Mazda customers. The campaign will launch on Friday May 22nd in cinema and television with a mixture of a :60 and :30 second ads. It will be supported digitally and on our social channels. "Mazda makes cars for people who take pleasure in driving, and "Driving Matters" perfectly aligns with that philosophy. Through our creative process, it became evident that Mazda's inspiration for pure driving enjoyment is something that relates to the typical car buyer," said Harvey Marco, creative director, Garage Team Mazda. 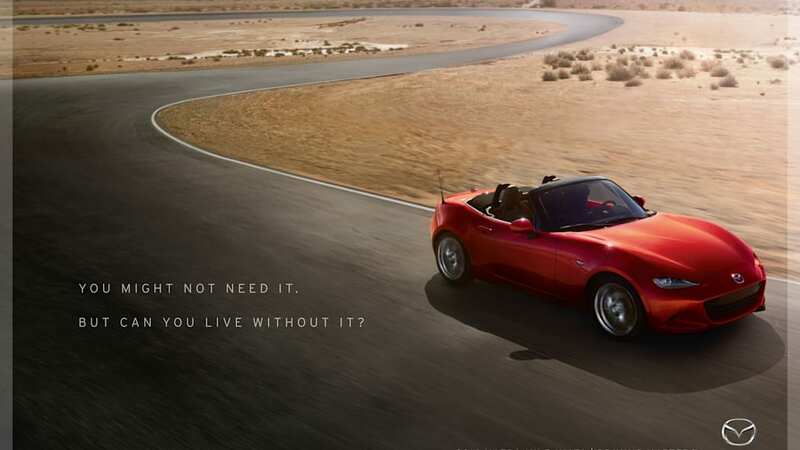 Mazda's long-running Zoom-Zoom tagline will continue to be a part of the brand's DNA. Since its inception in 2000, Zoom-Zoom has come to symbolize what a Mazda stands for – stylish, insightful and spirited – and the Driving Matters campaign will communicate the company's core belief in the joy of driving and illustrate the emotional enhancement driving has on our lives in everyday situations. Mazda will deliver the new advertising message via in-cinema, television, print, out-of home and digital media. Assets from the campaign can be seen on Mazda's media website here.